The Irish Claddagh Rings are probably the most culturally rich pieces of jewelry ever recorded in history. The meaning, significance and history of the Cladagh ring has a rich ancient past that dates back to over 300 years. The design of the Cladag ring and even the way the ring is worn are all deeply rooted in Irish tradition. Kaisilver, strives to keep the Irish Cladagh ring tradition alive and creates the world's best Claddagh gold and silver rings. All gemstone options are available and great attention is paid to every detail. Today, the meaning of the Claddagh ring and the significance of wearing Claddagh rings has spread far and wide. The Cladaugh ring is made and worn far beyond the small fishing village in Ireland where the tradition started over 300 years ago. Meaning of the Claddagh ring. What do the Cladagh rings mean? The meaning of the claddagh ring is what gives the ring it's significance. Over the years the cladagh ring has brought up designs with minor variations, the basic meaning and significance of the Irish claddagh ring has however been retained. The hands of the ring are shown holding the heart and the hands denote friendship and togetherness, the heart itself signifies love and the crown in the claddagh ring stands for loyalty. It is this meaning of the claddagh rings that make them an ideal choice for all occassions, wedding rings, birth stone rings, engagement rings, mothers day rings and rings for just about any other occassion. The deep and true meaning of the Irish claddagh rings has also put them into a group of rings referred to as the faith rings. In today's materialistic world where love, friendship and loyalty are becoming increasingly rarer by the day, the claddagh ring with it's realistic and worthy meaning makes an ideal gift to give and to receive. In a nutshell the meaning of the Claddagh ring could be summarized as, Let Love and Friendhsip Reign Forever. History of the Claddagh ring. The Claddagh Irish tradition. The history of the Claddagh ring dates back to over 300 years. A small fishing village in Ireland called the Claddagh was where the tradition of the Claddagh rings first started. The word Claddagh itself comes from the Irish term 'An Cladach' that means a 'flat stony shore'. This was a pretty and ancient village with winding streets and small thatched roofed mud houses. Modernisation has changed all that now but the tradition of the Claddagh ring lives on and has infact grown much stronger in many parts of the world. There are two theories put up explaining the first occurence of the Cladagh Irish ring. First Theory: Margaret Joyce inherited a huge amount of money from her late husband named Domingo de Rona. He was a wealthy Spanish merchant trading with Galway in Ireland. She later married the Mayor of Galway in 1596 (Oliver Og French)and used her inherited wealth to construct many bridges in Connacht. The first Cladagh ring was supposed to be her providential reward and was dropped by an eagle into her lap. Second Theory: A native of Galway by the name of Richard Joyce was captured by the Algerians and sold as a slave to a Moorish goldsmith. Later in 1689 William III of England demanded the release of all British subjects and Richard Joyce was released from slavery too. The Moorish goldsmith offered Richard Joyce a major portion of his wealth and also his only daughter in marriage, if he agreed to stay in Algiers. The story goes that, Richard Joyce refused all the tempting offers and returned to his native city with the first Claddagh ring. These are the two major explanations for the history of the Claddagh ring. It does not matter which theory you believe in, or if you believe in neither, because everyone agrees that the Claddagh ring has a history and meaning that is significant to this day. Wearing the Claddagh ring. Which hand to wear Cladag Rings. The meaning and significance of the Claddagh ring is not just in the crown, heart and clasping hands, it also extends to the hand on which the ring is worn and the direction in which the crown on the ring points. In case of a married or engaged person Claddagh rings are worn on the left hand with the crown pointing away from the (the person wearing the ring) heart. For a person willing to consider love the ring is traditionally worn on the right hand with the crown pointing away from the heart. For a person not interested in starting a relationship the Cladagh ring is worn on the right hand with the crown pointing towards the heart. The Irish Claddagh ring as a Wedding or Engagement Ring. The Claddagh ring is one of the most popular Irish Wedding Rings. Traditionally the ring is passed down from a mother to her daughter. Today this Irish traditional ring is popular in many countries as a wedding ring or an engagement ring. Kaisilver has added an extra dimension to this issue by providing custom made high end claddagh rings in 18K Yellow or White Gold. These claddagh rings are available in all sizes with any gemstone of your choice. On the higher price range, Cladagh rings are also available with diamonds in the crown to add beauty and glitter to this ring. As expected, high end craftsmanship would be a must for all special occassion rings and Kaisilver provides just that. In the final phase of production every ring is hand finished to perfection. If you have read the above paragraphs on the deeper meaning, history and significance of the Irish cladagh ring, you will surely realize why this ring makes a perfect wedding or engagement ring. Design variations for your Claddagh rings. As the meaning and significance of the Irish Claddagh Rings spread across the world, jewelry designers tuned the design to appeal to a wider section of jewelry buyers. This brought up a few prominent design options for the Claddagh ring. In all these cases, the deeper meaning and Irish tradition are left intact. The first major variation was the Cladagh ring with two hearts instead of one. There was another variation without the crown, this design however retained the hands clasping the heart. 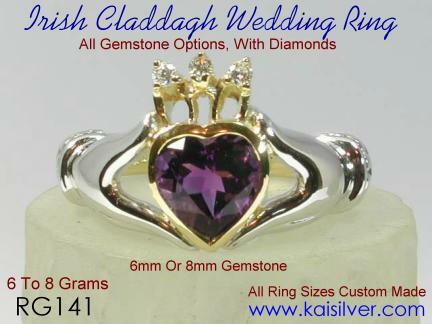 It was Kaisilver who gave the ring it's artistic and classic appeal, by releasing the first high end claddagh rings with all gemstone options. The design, attention paid to every detail, the clarity and graceful fingers holding the heart are some of the features of the Kaisilver Claddagh rings that took the world by storm. The Kaisilver claddagh design ensures that your gemstone is firmly mounted and protected from side impacts from all sides. The healthy gold weight also ensures that the ring will retain it's shape and not twist and bend out of shape at the slightest excuse. Male Claddagh Ring. 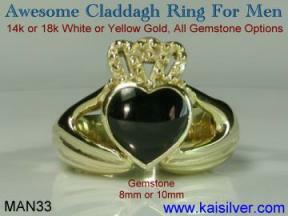 Are male Cladagh rings available. Claddagh rings are available for males too. As expected, the male Claddagh ring would be heavier than the claddag ring created for ladies. If the male Cladagh ring is made with a gemstone, the size of the gemstone would be much larger too. Because of the more active lifestyle followed by today's man and the fact that men are not as careful with their jewelry as ladies, a good gold weight for the male claddagh ring is a must. There is ofcourse no reason why the male Claddagh ring should not have the same high end craftsmanship. The design for a male ring should lay emphasis on being sturdy and durable, this can come without any compromise on good style and craftsmanship. If you are interested in a pair of rings for your wedding or engagement you can always custom order a pair of claddagh rings with gemstones of your choice. Silver Cladagh Rings also available as high end rings. For most jewelry buyers, the Claddagh ring is a symbol of love and friendship. The ring is worn for it's rich tradition and significance rather than as a display of wealth and luxury. With this background, it is really not necessary to always create Claddagh rings in gold alone. Sterling Silver Claddagh Rings can also be made with all gemstone options and with the same high end craftsmanship as the gold option. The classic and elegant look of sterling silver has attracted many jewelry lovers throughout the world, it is not just the lower price of silver that appeals to these silver jewellery lovers. The best way to create a sterling silver Cladag ring is to have it made without any Rhodium or other plating. This would allow the silver to tarnish as normal silver does. You can polish your silver ring with any recommended polish or fabric. This method gives your Claddagh Silver Ring a classic and antique feel which is ideal for a ring that has a 300 year old rich tradition. Other Terms and Spellings used for the Cladagh Ring. The claddagh ring has a history that goes back to over 300 years, few variations in designs have evolved over time. However what is amazing is the number of ways in which the claddagh ring is actually spelt. The correct spelling is 'claddagh' but a common spelling for this is 'cladagh' with a single 'd' and then the all famous 'clladagh' this lays double emphasis on the 'l' and goes light on the 'd'. We have numerous queries from buyers for 'cladaugh' rings, so this could be a popular spelling too. Finally is the spelling that is long and almost spells out every sound in every alphabet in the word, the 'calladagh' ring. So the next time you come across these spellings rest assured that they refer to the famous Irish Claddagh Ring. Other Names For The Ring, these names have been derived by identifying the tradition or the features of the ring and so you have the 'clasped hands ring', a little more elaborate is the 'clasped hands and heart ring' or simply the 'hands and heart ring'. Because of a design variation that had two hearts in it, the ring also got the name of the 'double heart ring'. Linking it to it's origins gave it the name of the 'Irish heart ring' and also the 'Irish wedding ring'. Because of the significance of the ring the name 'faith ring' is used. The faith rings are infact a group of rings and the claddagh ring is often included in this group. The history of the claddagh Irish ring highlights the deeper meaning and significance of the ring. If you are interested in this stunning jewel, there are a few options that you can choose that will help enhance the meaning of your ring. The first option is to make this ring as a birth stone ring and this is quite easy since we provide all gemstone options. If the ring is for a special occassion ring like a wedding or engagement, you can still have your birthstone set in the ring. Another option is to go for a pair of claddagh rings where, the lady's and men's ring have the same design and differ in gemstone size and overall ring dimensions. There is a growing trend towards exchanging birthstones where the lady wears a ring with the birthstone of the man and vice versa. This is expected to build a close bond between the couple (or friends) even when they are geographically hundreds or thousands of miles away. The claddagh ring history tells us of how special the occassion was when the first ring was made over 300 years ago. It is very likely that your claddagh ring is being worn to signify a special occassion like a birthday, an engagement or even a wedding. It is therefore an excellent idea to have the ring etched with a short message, a name or a date inside the band. The length of the message will depend on the overall size of the ring as, etching a long message on a small ring would cause the text to be virtually unreadable. We provide this etching service at no additional charge and our experts will advise you regarding the message size that is suitable for your ring. With over 6,000 buyers in 17 nations, Kaisilver is the world's largest online provider of high end custom jewelry. Over 3,500 skilled craftsmen and artisans work on all our jewelry orders and are guided and inspired by 7 top notch designers selected from 5 nations. We are directly networked to the world's leading producers of gemstones and this gives us preferential access to a massive base of over 200 million carats of gemstones. All jewelry is custom made and you can choose from 14k or 18k white or yellow gold for your claddagh rings or other jewelry. We are the only online provider to offer high end custom sterling silver jewelry even for single piece orders. We custom make all kinds of jewelry as per your designs or ours and every gemstone used is handpicked and custom cut by our experts. You can send your queries and questions to sales@kaisilver.com and our team of experts will be glad to answer your emails. You are under no obligation to make any purchases from us, so do take the benefit of our expertise and experience regarding any gemstone or jewelry queries that you might have. Kaisilver jewelry buyers include government officials, sportsmen, members of the U.S armed forces, doctors and surgeons, financial experts, fashion models, engineers, lawyers, professors, students and others. We do not indulge in publicity gimmicks like high pitched advertising with the hope of peddling substandard light weight junk jewelry. We rely fully on satisfied buyers to grow and ensure that every single order provides the buyer with good value for money paid. 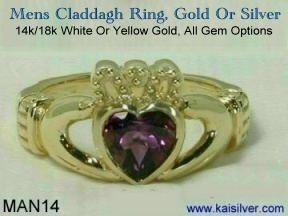 Kaisilver provides high end custom made claddagh rings and other jewelry. All gemstone options are available, design variations are also provided. 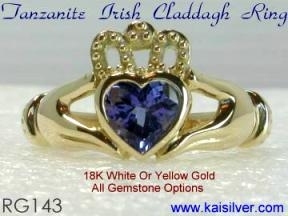 Order your custom claddagh ring with or without diamonds. Available in 14k or 18K yellow or white gold and even sterling silver. Click for details Because of it's deeper meaning and significance the claddagh ring is an ideal ring for all occassions, mothers day, anniversary ring, wedding ring, engagement ring, valentine's ring and also a birthstone ring. The high end craftsmanship on our claddagh ring and other jewelry, has made us a favourite for claddagh rings world wide. A gorgeous tanzanite gold claddagh ring, this claddagh ring would look equally gorgeous in white or yellow gold or sterling silver. Click for details. 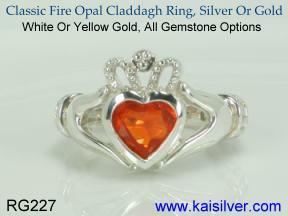 Your Kaisilver opal claddgh ring can be ordered with a white opal or fire opal. Gold or silver opal rings have handpicked gemstones. Click for details. Join The Kaisilver Mailing List Stay informed about latest developments and products, straightforward and frank advice from one of the most respected name in high end jewelry. No sales gimmicks and blow out and close out sales that peddle junk in the name of jewelry. We are on your side. Subscribe Or Unsubcribe To Our Jewelry And Gemstones Newsletter: This Newsletter Provides General Information About Gemstones And Jewelry In Simple Terms. No Technical And Trade Jargon. Straightforward Answers To Issues That You Always Wanted To Get Information About But Never Knew Whom To Ask. Our Mailing List Is Independently Maintained By Bravenet. There Is A Double Confirmation To Be Made Before You Are Added To The List. We Do Not Sell Your Email Address, We Do Not Encourage Or Indulge In Any Affilliate Program Gimmicks. We Have Zero Tolerance For SPAM. When we talk about the history of the Claddagh ring and mention that the ring is one of history's most meaningful jewels, we need to consider a few facts. There surely have been more famous and lavish jewels in history, but most of these jewels were owned by kings and rulers that amassed wealth by plundering their subjects or by conquering lands across boundries. On the other hand, the history of the Irish claddagh ring has a very touching backdrop since the first ring was made under the tiring and harsh conditions of slavery. To truly appreciate the meaning and history of the Claddagh ring, you need to know the conditions under which the first claddagh ring was made more than 300 years ago. If you have read this web page you would have gained a valuable insight into a legendary jewel, that has gained an immense popularity despite it's humble beginnings.